In addition to allocating space to different functions, it is important with a garden, as with a house, to define and structure the space, whether formally or informally, so that the different functions of each area are clear. 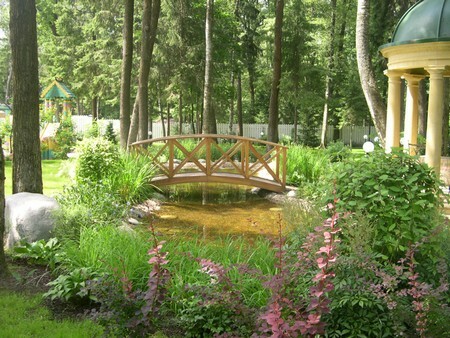 Each garden has a given area, quota of sunlight and shelter from the wind. Different planting arrangements can provide either additional shelter, shade or sunny areas. We can also use plants to define and organise space: we can prune them into different shapes, grow them up trellises and across pergolas or we can let them grow wild to produce more natural shapes. In this way we can struc­ture our gardens with the plants themselves. Landscaping the soil is another way we can structure the garden—it provides a great place to try out an earth wall if you wish to experiment. If you have a slope to contend with, you can use this to maximum effect by terracing. Paving can also be used to structure the garden by helping to define areas for human use. Formal shapes, such as squares, or natural shapes such as spirals or tessalations, can also be used to structure the garden and give it a particular character. Different functions require connecting either formally or informally with circulation routes. Access points, doors into and out of the garden need to be incorporated in ways that make the most of the available space. Are there paths that you use only for getting from A to B? Ideally such paths should link up any paved areas so as to cut down on circulation space. If you have a small garden, what can be done to make the very most of the space available? It is possible to achieve very effective results by using small scale or miniature versions of plants along with small-scale paving (such as granite sets). Another way of creating a feeling of space in a garden is through the use of light. To this end, it is useful to grow light coloured plants up vertical surfaces or, alternatively, whitewash any enclosing walls. Careful deci­sions need to be made as to which features or functions should be included as it is a mistake to try and achieve too many different objectives. Sitting areas may well need to be up against walls or in corners, and compost bins need to be carefully sited. Having a buried compost bin, with just a small lid showing, as some Japanese do, can be a way of dealing with this problem. If you have very little room for trees then you can either have them trained to spread flat against a wall (an espalier), or you can provide a pergola or trellis up which to grow climbers such as clematis or runner beans. 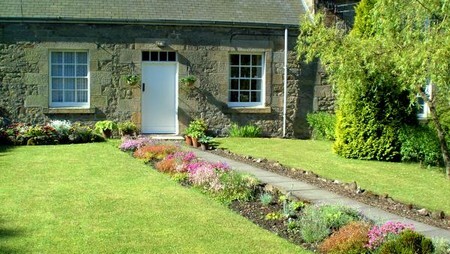 Plants grown up the side of a house can fulfil several different functions. They can deflect rain and keep the wall dry and in so doing add to the insulating properties of the wall and reduce possible frost damage. They can also provide an attractive covering to the facades and a safe habitat for birds and bats. And they will help to improve air quality in built-up areas. There are several different sorts of plants that can be used for this purpose. Evergreens provide better weather protection in the winter. Ivy is the obvious example, but its growth needs to be controlled as otherwise it can do serious damage. If you provide support systems using wire or light wooden frameworks, then you can grow a far wider range of plants. For instance, privet or wistaria can also be grown in this way and trained where you want them to grow. These climbing plants also grow to varying heights, so it is worth matching the plant to the height of the wall you want covered. When planting creepers, this should be done about one metre from the wall. Window boxes are an example of container gardening which has a number of advantages. Containers can be used anywhere and, if not too heavy, can be moved around to suit the season and be protected from frost. They can also be maintained either in situ or at your leisure. It is important to ensure that if a container is used as a window box it is secured firmly or is heavy enough not to be blown off by the wind. Window boxes require a consid­erable amount of upkeep, but are a good way of providing a mini-garden for those that have no proper garden. Containers can be used for vegetables or miniature varieties of fruit bushes. As well as window boxes there are strawberry barrels, peat-free growbags or large pots. If you have a balcony or concreted back yard, these can provide added scope.